Feed pets special dental diets. This can help reduce the accumulation of tartar. 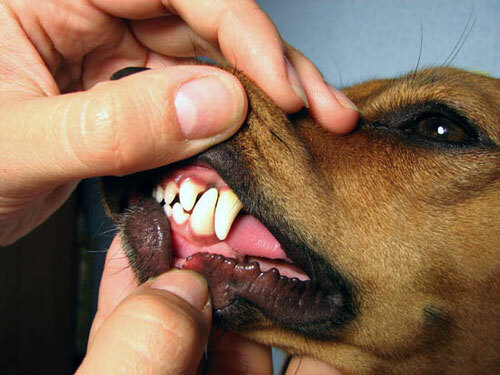 Firstly, you should have your pet's teeth examined by one of our veterinarians on a regular basis and if necessary, follow up with a professional dental clean. Your pet needs to be anaesthetised to carry out a thorough dental examination, and to clean all teeth without distressing them. Once anaesthetised, a complete dental examination is carried out. This process involves charting all present teeth and evaluating their condition, including the degree of tartar, gingivitis (gum inflammation) and any pockets in the gums around the teeth. In some cases, dental x-rays may be required - especially in older pets. Our veterinarians will then remove the tartar above the gumline using a special ultrasonic scaler, just like a dentist uses for our teeth. The teeth are then polished using a dental polisher and specialised fine-grade paste. If the dental disease is not severe, the procedure will end here. However, if certain teeth are so severely affected they cannot be saved, extractions will be necessary. In some cases, gum surgery is required to close the holes left behind when a tooth is extracted, and dissolvable stitches are used for this procedure. Once all dental work is completed, your pet may be given an antibiotic and an anti-inflammatory injection, the anaesthetic gas is turned off, and your pet is allowed to wake up. Pets are generally able to go home on the same day. Following a professional dental clean, a plan needs to be implemented to minimise build up of tartar again, and will depend on the severity of your pet’s dental disease. This may involve regular tooth brushing, veterinary mouthwashes or a special diet. It is recommended that all pets be examined 6 months after dental cleaning to determine the effectiveness of your dental care routine.